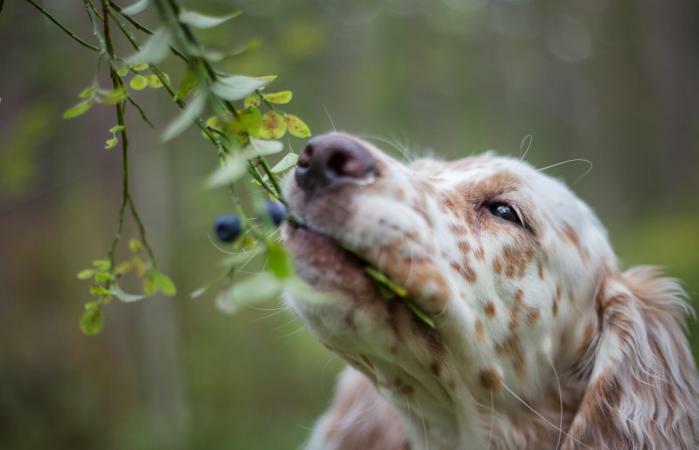 You may wonder, "Are blueberries safe for dogs?" It's a good question for concerned dog owners. Not all the foods that humans eat are good for dogs. Some "human foods" can even be poisonous or fatal for dogs. Careful pet owners should always check before adding non-traditional foods to a dog's diet. Veterinarians and canine nutritionists have determined that blueberries are safe for dogs in moderation. Blueberries are often included in commercial dog food and dog treats. They are low in fat and high in vitamin C and fiber. While no conclusive studies have confirmed that blueberries are actually beneficial for a dog, some studies have shown some positive effects of feeding dogs blueberries. One study was conducted in 2006 by the University of Alaska Fairbanks and published by the National Institutes of Health. In the study, sled dogs were fed blueberries as a dietary supplement while exercising. The results showed that the sled dogs had increased levels of antioxidants in the blood, which prevent damage from free radicals. This may have a positive effect on your pet since antioxidants play a role in fighting conditions such as cancer and heart disease. Other animal species, such as grizzly bears and deer, eat these berries in the wild. The key factor to the safety of blueberries is how much you give and the way you give them to your dog. The berries should be considered an occasional treat, not a daily supplement. The amount depends on the body weight of your pet. However, ten blueberries or less should be fine for all but the smallest dog. Too many blueberries may result in gastric upset and diarrhea. Be watchful for a reaction the first time you give them to Spot. If your pet has any history of stomach or digestive problems, you should not give your dog blueberries without talking with your veterinarian first. If you are confused about how much to give your dog, check with your vet for guidance. You want to ensure that the blueberries you give your dog are clean and fresh. Don't feed Spot old or moldy ones. If you wouldn't eat them, neither should he. Offering washed, raw berries is the best way to give your dog this fruit. Many owners give their pets frozen blueberries as a crunchy treat. Spot, of course, may have a mind of his own and eat a few off a bush. That's acceptable, although Spot really shouldn't eat things unless you have given them to him. You don't want to give Spot blueberries that are included in human food, such as pancakes, muffins, or pie. The problem is not the berries; it is the high sugar content of these sweet treats. Too much sugar is not good for dogs, so they should not have human food containing high levels of sugar. Instead of those sugary treats, try making your own blueberry dog treat. Are Other Berries Safe for Dogs? You might be wondering if strawberries, raspberries, cranberries and blackberries are safe for dogs. All of these are safe for dogs and can be excellent sources of antioxidants and vitamins. However, there are other fruits that you may not be aware are berries that are safe as well. These include bananas, kiwi, pumpkin, watermelon and kiwi. Tomato is also a fruit that your dog technically can eat if they only have the red fleshy parts. The green parts of a tomato plant are very toxic, however. Many wild berries such as those found on holly and other wild plants may be toxic and should be avoided. Are blueberries safe for dogs? The answer is basically yes, dogs can eat blueberries, but only in small amounts. If you have any concern about what to feed your dog, consult with your vet. You want to keep Spot healthy and happy for a long time.